Who invented the Cotton Gin? The name of the person credited with inventing the Cotton Gin is Eli Whitney (1765 - 1825). Eli Whitney is not only famous as the American inventor of the Cotton Gin but also as a mechanical engineer, farmer and manufacturer. When was the Cotton Gin invented? Eli Whitney invented the Cotton Gin in 1793, during the Agricultural Revolution (1700's - 1800's) period of invention. The invention of the Cotton Gin originated in America and is considered a highly important achievement to the field of Agriculture. Definition of the Cotton Gin: The Cotton Gin is defined as is a mechanical device that separates the seeds and seed hulls from the fibers of raw cotton. The machine consisted of a 'toothed' cylinder that revolved against a grate that enclosed the cotton seed. The teeth of the machine caught and pulled the fibers from the seeds. The fibers were then removed from the 'toothed' cylinder by a revolving brush. Fact 1: Who invented the Cotton Gin? The Cotton Gin was invented by Eli Whitney in 1793 during the Agricultural Revolution (1700's - 1800's) era of inventions which was a leading addition to advancements made in the area of Agriculture. Fact 2: Who invented the Cotton Gin? Prior to the invention of the Cotton Gin in 1793, it was a time consuming and arduous process to clean the small green seedpods (called cotton bolls). Fact 3: Who invented the Cotton Gin? The inventor of the Cotton Gin, Eli Whitney, was born on December 8, 1765 in Westborough, Massachusetts, United States. Fact 4: Who invented the Cotton Gin? Eli Whitney was inspired to such an extent that he was destined to achieve distinction as a great American inventor. Fact 5: Who invented the Cotton Gin? The early years of Eli Whitney were spent in Westborough, Massachusetts, New England where he was raised by his parents Eli Whitney and Elizabeth Fay Whitney. Eli Whitney received an excellent education and graduated from Yale University in 1792 with every intention of becoming a lawyer. Fact 6: Who invented the Cotton Gin? Following his education he was in debt and his first job was as a private tutor to the children of General Nathanael Greene on the Greene plantation in Georgia. Once he had made enough money to clear his debts Eli Whitney had every intention to pursue a career as a lawyer. Fact 7: Who invented the Cotton Gin? The Greene plantation was in the South where cotton was one of the major cash crops. Eli Whitney had never seen cotton growing until he moved to the Greene farm. Fact 8: Who invented the Cotton Gin? General Greene discussed the problems of harvesting and cleaning cotton and, realizing that Eli Whitney was an extremely bright young man, suggested that he might be able to invent a machine that would clean the bolls more quickly and efficiently. Fact 9: Who invented the Cotton Gin? Eli Whitney realized that he would be able to make a considerable profit from such an invention and decided to start experimenting with ideas to create a cotton-boll harvesting and cleaning machine. He was highly motivated to clear his debts and started to work on his invention of what would become known as the Cotton Gin. Fact 10: Who invented the Cotton Gin? The word "Gin" derived from an old English word 'gin' meaning an "ingenious device or machine". The word 'gin' was later commonly used as a shortened form of the word 'engine'. Fact 11: Who invented the Cotton Gin? The invention of the Gin was an incredibly simple device. The gin (machine) was housed in a rectangular wooden box and consisted of a roller, a mesh of wire teeth for combing out the seeds and a handle to turn the roller. Fact 12: Who invented the Cotton Gin? The bolls was put into the top of the machine across the roller and the handle turned the cotton-bolls through the wire teeth that combed out the unwanted seeds that would not fit through the mesh and fell outside. The clean, seedless cotton was then pulled out of the wire teeth and out of the gin. Fact 13: Who invented the Cotton Gin? On Eli Whitney applied for a patent for his invention of the Cotton-Gin that consisted of working drawings, a written description, a model and an application fee. Eli Whitney was granted his patent, number X72, on March 14, 1794. Fact 14: Who invented the Cotton Gin? The first Patent Act of the U.S. Congress was passed on April 10, 1790. The first act was then repealed and replaced by the Patent Act of 1793. As the Patent law was in its infancy very few patents had been granted and Whitney's patent had to be validated. Eli Whitney's patent was not validated until 1807. Fact 15: Who invented the Cotton Gin? The invention of the Cotton Gin was a great success. Eli's plan was not to manufacture his machine, but to offer a service for cleaning cotton. The Eli Whitney Cotton Gin separated the fibers from the seed ten times faster than slaves could do by hand. He was unable to keep up with the demand. Fact 16: Who invented the Cotton Gin? The simplicity of the Cotton Gin design and the delay in having his patent validated led to others copying his machine. They sold their gins at a handsome profit. 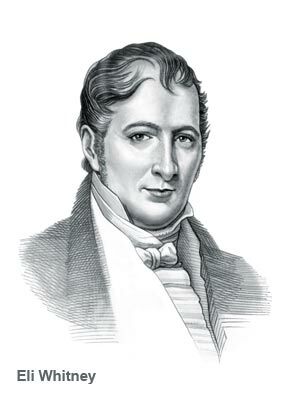 Eli Whitney issued patent infringement lawsuits but the costs consumed his profits and his business collapsed in 1797. Fact 17: Who invented the Cotton Gin? The invention of the Cotton Gin which automated the seed separation process made cotton production more profitable, increased trade and bolstered the economy of the Southern states. Fact 18: Who invented the Cotton Gin? The invention of the Eli Whitney Cotton Gin inadvertently invigorated the slave trade. Fact 19: Who invented the Cotton Gin? The invention of the Cotton Gin transformed Southern agriculture and although Eli Whitney did not become rich he did become very famous. Fact 20: Who invented the Cotton Gin? In 1817 Eli Whitney married Henrietta Edwards, the daughter of Pierpont Edwards, head of the Democratic Party in Connecticut. His marriage opened the door to some of the most men of the age and these connections ensured that his new arms business was successful. The couple had four children and Eli Whitney lived in comfort and security until his death. Fact 21: Who invented the Cotton Gin? Eli Whitney died on January 8, 1825 of prostate cancer. He was buried in New Haven, Connecticut. Fact 22: Who invented the Cotton Gin? Eli Whitney invented other items but his name will always be remembered in history as the inventor of the cotton gin who made a major contribution to the Agricultural Revolution.